Located in Cornwall, Pennsylvania, the Cornwall Iron Furnace is a major part of the National Historic Landmark District. This district is one of the largest and most compete iron making complexes in the nation. Visitors can expect to find lots of educational displays, national artifacts, and hands-on interactive learning activities in this amazing historic landmark. The Cornwall Iron Furnace is a prime example of the popular furnaces that were all over the countryside in Pennsylvania throughout the 18th and 19th centuries. The Cornwall Iron Furnace quickly became the heart of a self-sustaining iron plantation with the build-up of shops, schools, and churches around it. The iron industry flourished in Pennsylvania during this time. The area received the name Cornwall from a stone mason named Peter Grubb in the 1740s. The name was meant to honor his father since he came from an area in England with the same name. This furnace was in operation up until 1883 when it was abandoned because newer furnaces operated on anthracite coal rendering the Cornwall Furnace obsolete. However, the area around it continued to expand into a rich residential, agricultural, and industrial area and dozens of small villages were founded. 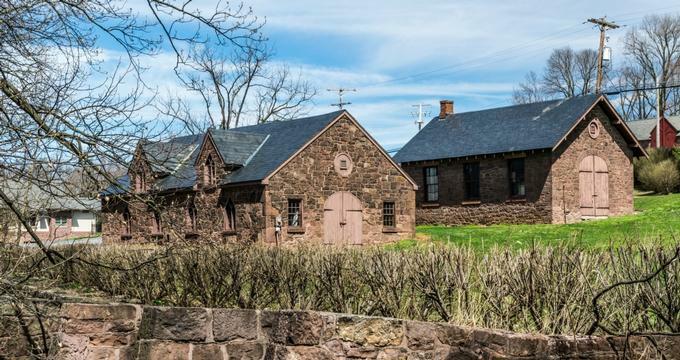 The area of Cornwall is rich with history and the Iron Furnace is one of the main contributing factors to the national landmark status it has achieved. The area provides a fascinating glimpse of history to all those who visit. Visitor’s Center:This building offers a large variety of interpretive exhibits on topics like mining, ironmaking, and charcoal mining. Visitors will catch a quick glimpse at the smelting process and can even buy a souvenir from the museum store. Connecting Shed:This area was used to protect the charcoal and other raw materials from weather as it was in the transportation process to the furnace building. Furnace Building:This building was constructed to in the elegant Gothic Revival style and was meant to refine charcoal, limestone, and iron ore before it was sent along to the upper level. This building is filled with machinery of the time and a casting room that visitors can tour. Roasting Oven:This area was built in the early 1800s and was meant to roast raw materials to remove the sulfur from iron ore. This structure was meant to improve the grade of ore produced. Stone Buttresses:This structure was meant to support the transportation of ore to the site from the mine. The railway utilized this area for storage, pick up and drop off of materials. Blacksmith Shop:This local shop was meant for blacksmiths to create and repair mining and ironmaking tools for the community. Wagon Shop:This area was where wagons were both repaired and constructed for the community. Abattoir:This building was also built in the Gothic Revival style as a part of the Cornwall estate and operated as a butcher shop and smokehouse. Stable:This building housed the horses for the Cornwall estate and the local community. Manager’s House/Office Building:This massive stone building was built in the 19th century and served as the furnace manager’s home. This home is quite large because the furnace manager was second in command of the entire plantation. Open Pit Mine:During its hay day, the Cornwall plantation produced over 100 million tons of iron ore deposits. This pit reaches a depth of more than 5oo feet. Miners village:In 1865, housing was supplied to furnace workers and miners, but today a lot of the houses are private residences. Paymaster’s Office:This building served as the office for the Cornwall Estate and surrounding iron plantation from 1886 – 1901. Ironmaster’s Mansion:This mansion was built in 1773 by the Grubb family for the ironmaster to reside in. Finding Esther:Guest lecturer, Dr. Patricia Gibble will host a talk on November 14 at 7p.m. For more information on upcoming events, please visit the calendar of events. 22nd Annual Christmas at Cornwall House Tour:On December 2, 2017, the annual Christmas tour will be hosted at the Cornwall House. The plantation will be covered in snow and holiday decorations for guests to enjoy. The tour will be hosted from 10 – 4 p.m. There are lots of educational resources and programs available at the museum including gallery tours, classroom outreach, and special programs for children of all ages. There is also a video tour and recommended readings for visitors to get the most out of their visit.